On Friday, September 26, the Devotion School Building Committee reviewed options to renovate and expand the school at a meeting held in the first floor south meeting room at Town Hall, starting at 8 am. All but one of the 20 committee members were present, and about 15 Brookline residents attended, including members of the School Committee and Advisory Committee. Betsy DeWitt, a member of the Board of Selectmen, chaired the meeting. Committee member Helen Charlupski, a member of the School Committee, participated by telephone. Under that circumstance, the state’s Open Meeting Law calls for roll-call votes. Anthony Guigli, designated as Brookline’s project manager, took notes and recorded votes but did not cast a vote himself. 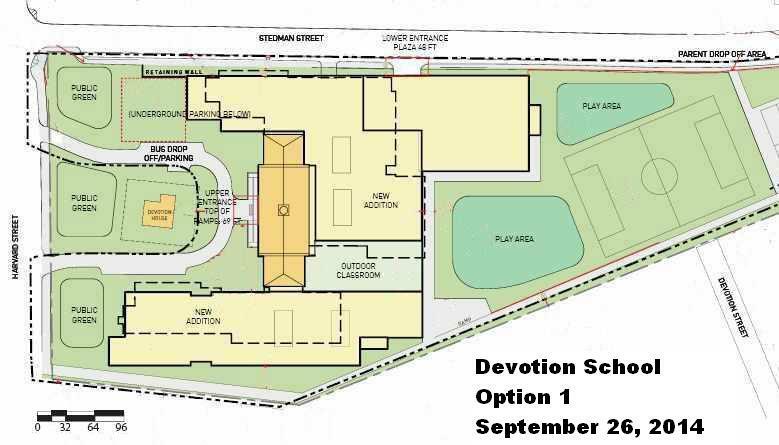 Options: At a public hearing on September 10 at Devotion School, the committee’s architects, HMFH of Cambridge, had described three design options to an audience of about 150. The same staff from HMFH returned for the final review: George Metzger. assisted by Deborah Collins and Andrea Yoder. This time, there was more discussion of construction scheduling and of some preliminary cost estimates. Option 1 is similar to current buildings, replacing the current north and south wings with larger structures of the same heights. However, a proposed new north wing extends 148 feet eastward down Stedman St., compared with the current one. A new south wing would be wider, shrinking the outdoor area near Babcock St.
Option 2 removes the current north and south wings and builds a large structure behind but connected to the current central building, three stories toward Babcock St. and four stories toward Stedman St. Option 3 is similar to option 2, but the new building becomes five stories toward Stedman St. It moves back and disconnects from the central building–no longer to be part of the school–taking up most of the current field area. Community views: At the September 10 hearing, it appeared that none of the three options was acceptable to much of the communities of Devotion parents and North Brookline neighborhoods. There was strong opposition to option 2 and option 3, seizing most or all of the field behind the Devotion School today and even some of the community spaces beyond them. It is not necessary to do that in order to add the amount of new space the school is said to need. After the hearing, Ms. Dewitt and others said, parents and neighborhood residents sent in over 50 letters, many voicing similar objections. Several in the audience at Town Hall September 26 wanted to speak, but Ms. DeWitt said views had been aired, and this was a meeting for the committee to discuss the options and decide. Committee review: At the September 26 meeting, option 3 was subdivided into a version retaining the current central wing, opened in 1915, or else, in “option 3A,” demolishing it to add “play space.” Committee member Sergio Modigliani, an architect and Planning Board member, said the option to “mothball” the current central building was an “insult to the community” and moved to “take it off the table.” He did not seem interested in preserving an historic building, but he does not live in North Brookline neighborhoods. Town Administrator Mel Kleckner supported Mr. Modigliani, saying that it would be “too disruptive to leave a building on-site” and that the option 3 school “would not be located in the right place.” However, committee member Jim Batchelor, also an architect, who is a North Brookline resident and chair of the Preservation Commission, contended that option 3 was unsatisfactory either way. He moved to amend, taking both versions of option 3 off the table. Committee member Sean Cronin, the assistant town administrator, said he favored option 3 but it “was not going to get more than…two votes.” Committee members seemed to get themselves into a tangle over what the motion and amendment really meant. In the end, Mr. Batchelor’s amendment was accepted by a vote of 10 to 8, and the amended motion passed by a vote of 12 to 6, eliminating option 3. Moving a wing: Committee member Linda Leary, representing the Brookline Historical Society, spoke in favor of moving the new north wing of option 1 closer to Harvard St. and pulling it out of the rear field. She asked the architects whether that was feasible. Deborah Collins, speaking for architects HMFH, said it had been considered. Although it made grade-level clustering more difficult, she said, it was possible. Dr. William Lupini, the school superintendent, said he preferred option 1 and would favor the change. Committee member Sadhna Brown, a Devotion parent, agreed. Ms. DeWitt cautioned that the change might involve an increase in building height but seemed to favor it. Weighing option 1 versus option 2, each committee member spoke briefly. Dr. Joseph Connelly, interim principal for Devotion, spoke up for option 1, saying it “maximizes the play space and gives the greatest potential to cluster the grade levels.” All but one of the school and municipal employees on the committee wound up in agreement with Dr. Connelly, including Dr. Lupini and Mr. Kleckner. Committee member Pam Roberts, a Devotion parent, preferred option 2, saying she likes “having everybody [closer] together” in a building with a smaller footprint. Committee member Sadhna Brown, also a Devotion parent, disagreed, saying the “quality of green space” is better with option 1 and that “meeting in hallways promotes interaction [among students], not [meeting] in stairwells.” Ms. DeWitt supported Ms. Brown’s views. A recommendation: By a vote of 13 to 5, the committee endorsed option 1 as Brookline’s preferred approach. The proposal will be transmitted to the state School Building Authority by October 2, and the SBA is scheduled to review it on October 19. If approved, the architects will begin to develop plans for option 1. The committee agreed to meet next on Monday, November 17, at 8 am, place to be announced. This entry was posted in Grade schools, Meetings, Projects on September 26, 2014 by Craig Bolon.